Online Clinic Management System is web based project. The main objective is to develop the software that covers all the aspects of management and operations of clinics. It enables healthcare providers to improve operational effectiveness, reduce costs, reduce medical errors, reduce time consumption and enhance delivery of quality of care. PolyClinic is web based application which covers all aspects of management and operations of clinics. This website covers features of Doctors Details, Patients Records, Online appointments, Patient reports, billings, Clinical tests, Medical store billings etc. The project supports to administrator to access complete application, Patient takes appointment through Online/Offline, Doctors manages patient reports, Receptionist approves patient’s appointment and makes bill, and medical Store Administrator can view suggested prescription. Each patients of the Polyclinic has a unique patient ID and password. By entering User ID and password patient can login to the polyclinic website and patient can view Appointment details, Patient reports, clinical tests, Billing, etc. 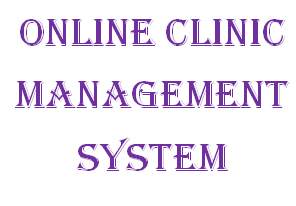 Online clinic management system is an online project . This project is developed using PHP as Front End and MySQL server as backend. PHP is a server-side, cross-platform, HTML-embedded scripting language. PHP (recursive acronym for PHP: Hypertext Preprocessor) is a widely-used open source general-purpose scripting language that is especially suited for web development and can be embedded into HTML. Here we used XAmpp server to run this project. MySQL is a open source Relational Database Manage.ment System. MySQL is very fast reliable and flexible Database Management System.